This is a project idea for a unique and special scarf that’s also pretty uncomplicated. Stripes of different widths create a message that the savvy reader can decode. The idea is pretty simple; beginners as well as more advanced crocheters should be able to create their own message scarves with names and phrases on them. You will need two colors of yarn (one for dashes and dots, the other for spaces), your hook, and a Morse code chart. There are many charts available on the internet, and they are usually labeled with which code they show. You may want to use the original American code, the international code, or the old continental code. Instead of using a chart, you can also run the message through an online Morse code generator/translator. 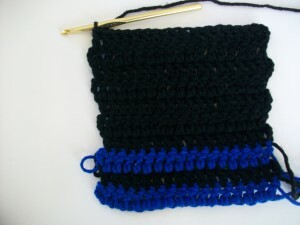 For this tutorial, I used blue for the dots and dashes and black for the spaces and a size J (6.0 mm) hook. For this scarf, my dot duration is one row. Write down your message and Morse code translation for quick reference. Start with your dot and dash color to form the first letter. This is the scarf with the first word done. Continue following the color changes until your entire message is spelled out, and you now have an expressive accessory. This is easy to customize using different stitches, colors, messages, and dot durations. For a finer yarn or shorter message, use a longer dot duration, and for a thicker yarn or longer message, use a shorter dot duration. 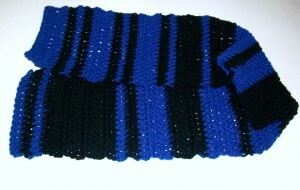 Here is a look at the finished “I am me” scarf. This entry was posted on Friday, October 14th, 2011 at 1:47 PM by Candace	and is filed under Tutorials and Help. You can follow any responses to this entry through the RSS 2.0 feed. You can leave a response, or trackback from your own site. You have the coolest stuff on here. I just love it! Thank you much. Ika, I used blue for the dots and dashes. This is fantastic! I’m terribly sorry, however, I can’t seem to see the translation of the phrase to the scarf pattern. Would it be possible to label row by row the first word you crocheted, so I might better understand? Thanks in advance! How many rows do you put between each dot/dash? Love this! Love all the creative “coded” scarves these days; e.g. your morse code idea here, weather scarves and illusion knits. So cool.